As readers of Confessions of a Pop Fan know, I went out this past Halloween as part of a group inspired by Wes Anderson's The Royal Tenenbaums. And when I say group, I mean pair, but that is a story for a different time. In any case, my regular collaborator Joëlle Jones and I went out and sang karaoke as Margot Tenenbaum and Eli Cash, as played by Gwyneth Paltrow and Owen Wilson in the movie. When I was shopping for my Eli gear, one second-hand store clerk told me that going as Wes Anderson characters was becoming a rather popular thing, but from what I hear they are generally half-assed Teams Zissou, which is kind of easy and not very detail-oriented. It was Joëlle's idea to do the crazy Eli make-up. It was mine to make a copy of Old Custer. I was inspired to do so when I took the time to sit down and revisit my Tenenbaums Criterion DVD. I was looking to see what kind of variety of shirts Eli wore (surprisingly, that was the hardest and most expensive of the accessories to find), and the idea struck me. Joëlle was already going the whole way to make Margot's fake finger, and I needed to at least match her game. To pull it off, I had to take a screen capture of the image from the DVD picture gallery, isolate the cover image, and blow it up. Unfortunately, the Kinko's printer didn't print the image how I had sized it, but refit it to the page--something I did not discover until I got home, thus forcing me to improvise a more Frankensteinish creation. Wes Anderson films are ones I watch every couple of years. Rushmore (#65) and Tenenbaums were also regular spins when I worked at an indie video store between 2004 and 2006. In that kind of environment, you aren't really afforded the luxury of paying a lot of attention to what is on the TV, so it's best to go with discs of sitcoms or old favorites that don't require your rapt attention. Either of those movies are ones I can check in or out of at any time and feel right at home. Which is how I think Wes Anderson designs them. Not necessarily on a conscious level, but in his way, he is creating a completely different world for himself, someplace he can go visit and presumably feel comfortable. I don't know what his history is, but looking at how both he and his brother Eric (the illustrator for his movies, who also drew the neat covers on the Criterion DVDs) approach their art, I would assume that either of them had a childhood where their imaginations were either actively encouraged or where they needed some kind of outlet to get away from a harsh family life. I know that the latter is part of the reason I spent so much time in my own head. My parents fought pretty regularly and we often had wide-open backyards where my father kept his horses. It was easy for a little boy to disappear into invented landscapes when there was so much actual room to roam and so much reason to do so. Hemingway famously said that most writers all write one story over and over, and that story is essentially about their search for a father. It's extreme, to be sure, but it has a grain of truth in it. The first part of the quote is harder to avoid than one might think, and the second should probably have a broader scope than just "father." All stories represent a search for something in general, despite the specifics. Looking at Wes Anderson's early filmography, fathers definitely play a large part in all of the movies. Even in Rushmore when the father is still around, there is something that Max is not receiving from him that he must turn to Bill Murray to find. In The Life Aquatic (#300), you have a character who comes to find the father he has never met only to encounter a man who himself is chasing something intangible, trying to retain a boyhood that has long passed. In The Royal Tenenbaums, the Tenenbaum children don't need to find their father, he is right there. As with Steve Zissou in Aquatic, however, Royal Tenenbaum, played with panache by the great Gene Hackman, has been so preoccupied with his own selfish interests, with maintaining his freewheeling immaturity, he hasn't really been right there, he's been absent. (This makes it somewhat ironic when he criticizes Margot's animal pageant for being childish.) One could argue that he needs to find the father within himself to fix his family. His behavior has fractured the unit and his eventual disappearance from the homestead sent the children in their own individual directions. Even as a dysfunctional patriarch, Royal at least gave his family something to rally around. Getting to the depths of what a schmuck their pop was provided a common purpose. Wes Anderson clearly has a working knowledge of the fiction featuring J.D. Salinger's Glass family. The Glass children are the interlocking characters who populate Salinger's work post-Catcher in the Rye. A family of geniuses, they have all struggled to come to terms with their big brains and the problems their abnormal childhoods have caused. Like the Tenenbaums, most of them peaked early, have been sent wandering in search of some kind of purpose be it spiritual or material, and are gripped in an unbreakable melancholy. They have also been touched by suicide. With the Glass family, Salinger provides a near perfect model for exploring the transitional anxieties of growing up feeling abnormal. It's a peculiar artistic temperament, coming of age with the feeling that there is something more you should be doing with yourself but yet not understanding how to make that happen as an adult. P.T. Anderson drew on that influence for his quiz kid character in Magnolia --the Glass children competed on T.V. game shows and were trotted out as a clan of freaks in a manner not dissimilar to the book that Etheline Tenenbaum (Anjelica Huston) wrote about her genius progeny. This preoccupation with the Salinger kids is one I have in common with Anderson, and it was something I drew on for the three Scott brothers that are the driving force of my novels and comic books. In fact, when I stop and think about it, there is an eerie symmetry between my three brothers and the three siblings in Anderson's most recent and possibly most mature work, The Darjeeling Limited. The successful older brother who tries to bring the trio back together, the aloof middle child who just can't be bothered, and the youngest, a writer who has been traveling in an attempt to exile himself after a romantic failure. Sound familiar? 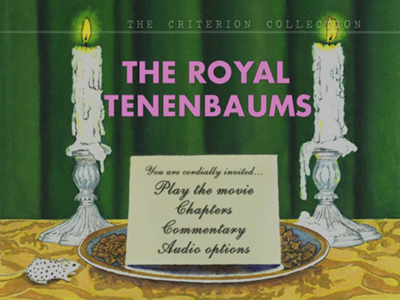 It's no coincidence that all three of the Tenenbaum children return to the home they grew up in when Royal re-enters their lives. Only Richie (Luke Wilson) comes back as a direct result of his father's schemes, but the frustration of having such a self-centered old man once again becomes a binding force for all of them. Even though it starts capriciously for Royal, the schemes eventually work because he really does get serious. He learns that to truly be there for his family, he must set aside his own needs and actually be there. It's about listening and doing, not just saying you're sorry. As Holden Caufield might point out, you can't be a phony. Kids know a phony when they see it. What gives Anderson's film an odd twist is that the search for these connections, the quest for healing and belonging, doesn't end up extending beyond the insulated world he has created; rather, the struggle only affirms the importance of this environment. Look at Eli Cash, who always wished he was a Tenenbaum, who is always being pushed to be let into the family. His perceived outsider status drives him crazy and he seeks solace and acceptance through other means, until he quite literally crashes into the family home and enters by smashing through the window. For better or for worse, at that moment it's proven that he really is part of the family. His fight with Chas (Ben Stiller) is the kind only brothers can have, where the violence settles into something that looks a lot like love. For Wes Anderson, his films are less about the individual search but more about the creation of the unit. Though the father may be the catalyst who sits at the end of the table, Anderson's affirmation is in the establishment--or as it were, re-establishment--of the family unit. This is why The Royal Tenenbaums may be his most perfect expression of this theme. The house at 111 Archer Avenue is Anderson's own time capsule, the closed circle, the only place where the many can be one. From the closet full of board games to the lovingly drawn portraits, time stops inside those walls. It goes on outside of them, and even is subject to decay, as represented by the always-dented Gypsy Cabs; nevertheless, inside, your failures don't matter, time can't touch you, and while at the start of the film, this also means that the hurt and the anxiety never goes away either, by the end, Royal has fixed that crippling glitch. He heals the wounds and makes the house a home once more. This is what Wes Anderson has asked us in to see. That "invitation to a party" motif is deliberate. The Darjeeling Limited suggests that Wes Anderson is putting many of his thematic obsessions to rest, serving as a eulogy for his preceding films. Personally, I'm excited to see where he goes next. As it stands, though, if he were to leave us with just the five he's made so far, The Royal Tenenbaums will remain as the perfect center of his work, the beautiful eye of the storm where everything came together with a calm solemnity. Perhaps it's fitting that the cast of his next two scripts were rootless, were beginning to search for happiness beyond their comfort zone. In a way, Anderson has to learn he can't ever return to this home again, even as that is counterproductive to the film's message. As an artist, eventually you have to break free. Just as we can guess that the Tenenbaums achieved the freedom to search and be confident in themselves again through their simultaneous embrace and letting go of the past, so too may their creator be discovering the same sense of abandon. Let's go, buddy. It's time to start scrappin', yellin', and mixin' it up. Don't forget to visit James Lucas Jones' gallery of Tenenbaums drawings by comic book artists. This was the first review I have read of yours. I'm curious as to whether or not you review the Criterion Collection version of these movies, or just the movie in general. I kept waiting for a review of the supplemental features or Criterion HD transfer, but you never mentioned them. I'm going to read a couple more before of your reviews to see if this was the exception to the rule. I obviously do not speak for everyone, but I would love to see reviews on the Criterion treatment. This could have simply been a review of the movie you saw in a theater some night. Thanks for stopping by. All the reviews here are written after viewing the Criterion editions, but they are split into two categories for review. Some of them are written for DVD Talk, and they contain a link at the bottom to the full posting there, which includes info about the transfer and bonus features, as per their format requirements. The others I write for the site exclusively and so I abandon the imposed format and only cover the other features on the disc if I feel compelled to do so. To me the movie is the most important thing, and since I am writing here under my own aegis, I'd rather indulge the freedom the lack of regular structure provides me.